Now is the time to become aware of these sacred truths: Open your minds, open your hearts and allow these sacred truths to uplift your consciousness. In love and in peace we are all one. 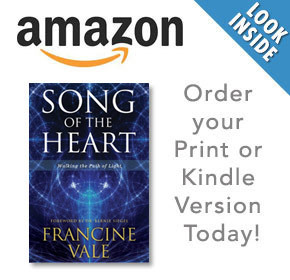 Read: The Structure of All That Is: sacred knowledge, the heart of Song of the Heart. Principles of Sacred Spiritual Healing: All people of planet Earth are being called on with urgency to manifest healing on Earth for your planet is in grave danger.We call on all of humanity in this present moment to enter into a state of complete dedication to the healing of all wars and conflict on every level of human interaction; within one’s own domicile, locally, nationally, or on a global scale. Dedication to this sacred calling includes a process of purification, release of desire to control the affairs of one’s brothers and sisters. All who have chosen to incarnate on Earth are brothers and sisters. The energy one commits to control of others, even loved ones, is energy utilized in opposition to the love and light emanating from All That Is, Divine Love, the Heart of God. This flow of love and light is available for all humanity, for every human being, in abundance. The energy of control creates blockages, thereby preventing a brother or sister from receiving their portion of Divine love and light. Another aspect of purification is the response with a loving heart, loving words, loving deeds, to each and every encounter with one’s brothers and sisters. A portion of one’s encounters may lead to suffering, disillusion, a heavy burden of tears. A loving response lessens one’s burdens. Aggression in any form increases one’s burdens. An unpleasant encounter met with aggressive response causes darkness to overcome the light. A loving response becomes instantaneous forgiveness, releasing the aggrieved and the perpetrator from embattlement. Instant healing. Another aspect of purification entails honesty and truthfulness beginning with one’s own inner dialogue. Pursuit of truth includes a balanced view of whomever may come under scrutiny, including oneself. The practice of balancing one’s thoughts leads to honesty unattainable otherwise. When emanating from a balanced source the highest ideals of love and compassion grow immeasurably. All truth is contained within the balanced vessel. Humanity, see the light within yourself and look to see the light within others. The purification process calls for a dedicated vigil of one’s thoughts and actions, intrinsic to manifesting peace on Earth. Those who desire to pursue a life of integrity, to create peace on Earth, will embrace purification with an open heart. A cosmic seed is held within every human being for fluency in healing planet Earth. It is humanity’s shared destiny. To engage in the purification is the highest of all human endeavors for the purification as it proceeds within the heart and mind of one human being gathers great momentum and increases the flow of love and light from the Heart of God, affecting all others touched by the life of this one. These others affect in turn additional others and so on. In this manner a higher consciousness becomes manifest on Earth and all aggression ceases to hold sway over the hearts and minds of Earth’s inhabitants. When an individual soul awakens to and becomes engaged in the purification process, a new and beauteous light begins to emanate from the physical vessel attracting the attendance of God’s messengers, angels and helpers, thus stimulating the Heart of God which awaits with infinite patience the purified ingathering of All That Is. When the Heart of God is thus stimulated the flow of love and light increases, providing a greater abundance of love and light on Earth. This in turn allows for awakening to quicken, allows the human heart to more effectively manifest love on Earth. We are beings of light bringing forth our sacred message. We are all one. Remember who you are. We say to you now, One who has, in the eternal stream of life, acquired a measure of wisdom, may with a heart of love teach others who seek wisdom. Therefore, go forth and spread our urgent message to all who come before you.